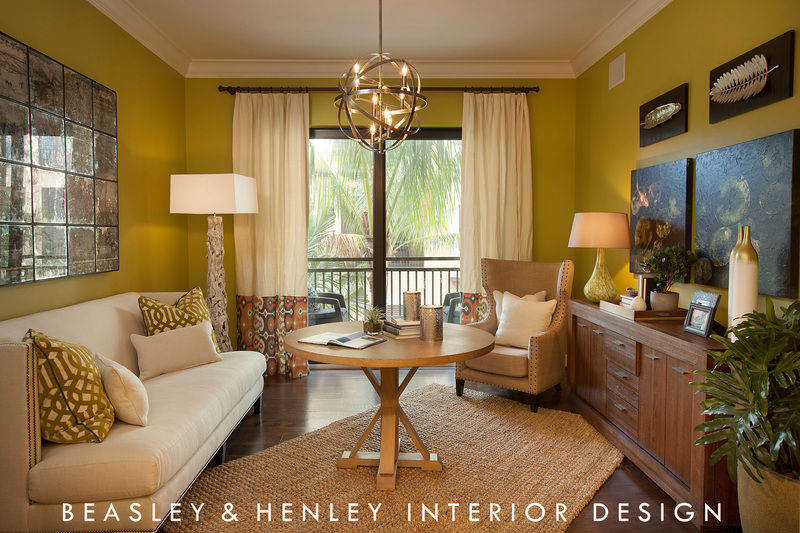 Award-winning interior design firm, Beasley & Henley Interior Design rounds out the 2013 awards season with a win at the 23rd annual Sand Dollar Awards. The innovative firm won Best Interior Design for their creative design at Esperanza Penthouse for WCI Communities at the prestigious community of Tiburon. Led by Principal Designer Troy Beasley, Beasley & Henley’s design of this luxury condominium attracts a wealthy European and American buyer. The sophistication is reflected in the easy transitional style and an overall palette of warm greys and crisp whites, with dramatic pops of coral and aquas. 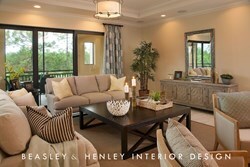 The Great Room emphasizes two seating areas that put the emphasis on entertaining. Two low sofas are a perfect location for watching movies on the wall mounted tv, while four club chairs are the well placed to share a glass of wine and a conversation. The Study is a true stunner with its rich chocolate walls and wood floors. Its unconventional design features a comfortable sofa, painted bookcases, and a high table providing a great place to pull up a chair and work on your laptop. The Master Bedroom with its exquisite wood floors is soothing and sophisticated with a fully upholstered bed and his-and-hers dressers. Two carefully appointed Guest Suites complete this home, which anticipates the needs of the homeowners, visiting, family and friends.